Summary from Goodreads: There’s no such thing as safe in a city at war, a city overrun with monsters. In this dark urban fantasy from author Victoria Schwab, a young woman and a young man must choose whether to become heroes or villains—and friends or enemies—with the future of their home at stake. The first of two books. Sing you a song, and steal your soul. Despite giving This Savage Song only four stars, I loved reading this book! It was fun and dark and amazing all at once. However, there were a few issues I had with it, hence the four stars. This book is basically a dystopian fantasy and starts out with Kate Harker burning down a chapel at her Catholic boarding school then being taken back to V-City where her Father lives. Fast forward a bit, and Kate and August Flynn, a monster, Sunai to be exact, are both starting school at Colton academy. Kate because she is finally living with her father again, and August so he can spy on Kate. But Kate immediately figueres there’s something up with August after meeting only a few times, and when she does, she’s horrified. Not long after, two monsters attempted assassination Kate and tried to make it look like August. So the two of them flee the monster infested V-City. Kate Harker is our first main character. All she really wants is to be back home with her father and to get him to like her, to be proud of her. This turns Kate into someone she’s really not, and you can tell. She wasn’t sure why, only that for the first time in ages, sitting in that strange but comfortable silence, she felt like herself. Not the Kate who grinned at the rumors, or the one who held a knife to a girl’s throat, or drove a crowbar through a monster’s heart. The Kate she’d been before, The version of her that made jokes instead of threats. I loved Kate’s character, but at the same time I didn’t. I found the whole burning down the chapel thing unnecessary. Though it’s only an act, a lot of other small things she did to try and make people afraid of her bothered me as well. Kate’s mother also died six (I believe) years ago when she was trying to escape the city with Kate, who wanted nothing but to leave the monster infested place. August wasn’t human. He wasn’t made of flesh and bone, or starlight. He was made of darkness. Then there’s August Flynn, a Sunai. Sunai are extremely rare, and he is one of three in V-City, the other two being his brother Leo and sister Ilsa. He was taken in by Henry Flynn and his wife Emily when he had been created after Leo found him in an ally. While all Kate wants is to impress her father, all August wants is, well, to not be a monster. He wishes he was a human, and not a monster that killed people with his music. The Sunai play music (August plays a violin, Ilsa sings, and Leo can do any sort of musical instrument) that can take the souls of people who have committed crimes or sins that have a shadow. They cannot take the lives of those who are not sinners. I wasn’t quite sure on what the other two types of monsters, Corsai and Machai, do though. Also, can I tell you how happy I am that there wasn’t any romance? I’m really hoping Kate and August don’t end up falling for each other in the next book because I found it really refreshing to read a book with no romance. Don’t get me wrong, I do like romance, but it’s nice to read a book every once in awhile that doesn’t have any. It’s set in V-City, the capital city of Verity, one of ten territories in the U.S. Victoria Schwab does a great job at world-building, and I had a vivid image of V-City in my head the whole time. V-City is a dystopian city full of monsters that are created by disasters. It was a very dark world. People are either paying Callum Harker, Kate’s father, for safety on one side of the city, or living in terror in Henry Flynn’s half of the city. However, I was a bit confused on the whole world in general, not just Verity. We got bits and pieces here and there but I want to know more about the world and how it was split into territories and how that all works. I’m hoping we get this in the next book. Other than that, the world-building was incredible. I also loved the writing. This is the first book by Victoria Schwab I’ve read, and now I get what all the hype is about. She does a great job with descriptions, and I could easily picture everything that was going on in my head. I’m excited to read some of her other works after reading this one. Now onto what I didn’t like. The beginning was kind of boring, being 100% honest. The first half was mainly the two main characters encountering each other a few times at school and showing their day to day lives pretty much. It was quite slow, that’s for sure. At the same time, I also didn’t want to put this book down right from the start. I would have liked more action in the first half. Once we reached the second half though, it was mainly just action and Kate and August running for their lives and trying to escape the other monsters. I really enjoyed all the action and fighting scenes, another thing Schwab did a great job of in this book. They were intense, and I didn’t get lost like I often do when there are too many people in one action scene. She doesn’t focus on what fifty people are doing at once, which happens way too often in books in my opinion. This made for a much easier and less confusing book to read. I also felt like there could have been more explanations on certain things. I was a bit confused for awhile there on what certain things meant, and they were explained much later than I would have liked. This caused some confusion on some small aspects. Though everything was explained by the end, it would have been less confusing in some areas if things had been explained earlier on. Instead, they were spoken about, but I didn’t have any clue what they really meant. There were also a few cliches thrown in here and there, though I’m not going to get into detail to avoid spoilers. I could have done without some of the cliches in this otherwise very unique story. Overall, I really enjoyed this one. It started off slow, but was all worth it in the end with tons of action packed scenes. I liked the characters, though I didn’t love them, and the world-building and writing were both amazing. Definitely one of my favorites of 2016, despite the small issues I had with it. Pretty sure I had the exact same issues as you did, but you just did a better job putting it into words haha. I agree about the world building. There was enough to keep me interested, but at the same time I wanted more. Like the whole other half (the South Side? I think it was called) of the city was never really explained. Then there was the thing with Kate that I couldn’t exactly put my finger on. I knew I liked August more, but I didn’t know why. I feel like your explanation was the reason why I didn’t like her as much. It just seems too much to burn a building down haha. But like you, this ended up being one of my favorites of 2016! I was totally confused on the other half of the city as well, like it was never really explained and I was like, wait do monsters work for Flynn or not? That kind of confused me as well. Kate just came across as so annoying at times, August was just adorable, despite being a soul eating monster and everything. I’m glad you enjoyed this one as well! Going back and having to read the blurb is so annoying, I hate when that happens. The concept was original, I mean a monster that plays music to steal peoples souls is pretty cool, but yes, the whole running from government/monsters thing wasn’t all that original. And I loved the characters! Well, Kate I had mixed feeling on, but I still liked her, but I loved August. I need to pick this one up at some point – I love books that incorporate music as a weapon. 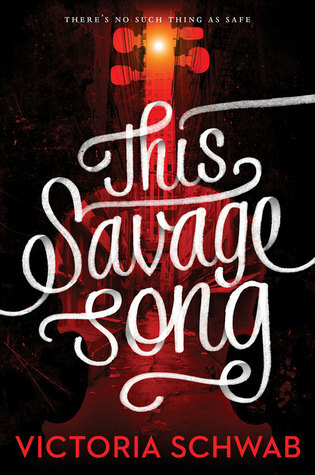 I’ve read A Darker Shade of Magic by the same author, so I’m fairly sure that I’ll like This Savage Song. I hope you have the chance to get to it, it’s a great book! This is actually the first book I’ve read that music was used as a weapon and it was sooo cool. 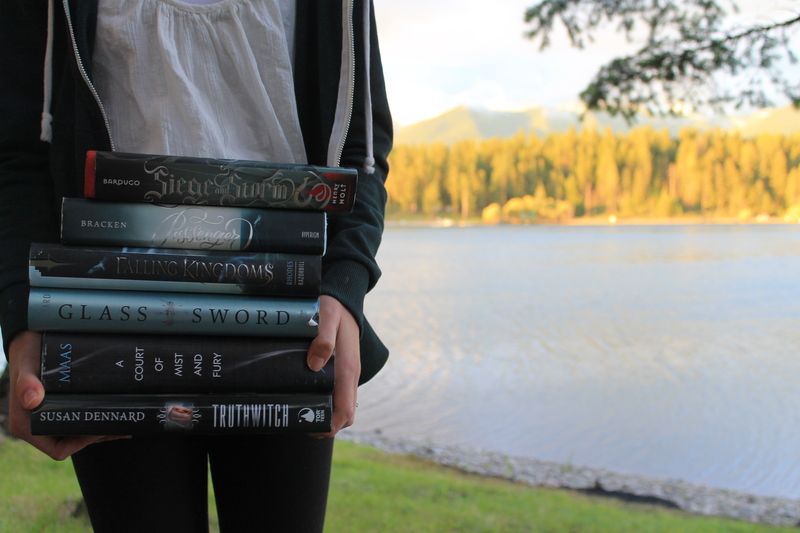 I still have yet to read Schwab’s other books, though I’ll get to them someday.